My daughter is very choosy at food, as probably all the children. She is only 2 years old, but she already has her favorite food, and not always agrees to try something new. By some miracle, she loved muffins and because of this they have stayed for a long time among the culinary experiments in our family. Muffins are easy to prepare and easy to vary. You can make both sweet and not sweet. Today I want to show a fairly simple recipe of muffins, the ingredients for which you almost always have at hand. 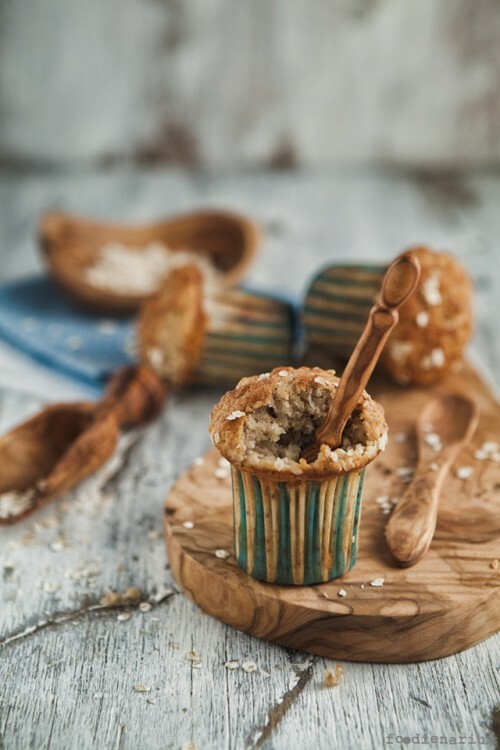 Besides, for me it’s important that according to this recipe muffins are moderately sweet and perfect for those who are not fans of various cakes and other sweet pastries. As actually me. Warm the oven to 375F (190C) (no fan). In a bowl mix the flour, baking powder and salt. In another one mash bananas to the state of puree. Grind nuts and measure out the other ingredients. In a mixer beat the butter and sugar, so that they are well mixed. Don’t overmix it. Add the eggs – one at a time, continuing to beat at medium speed. Also add there sour cream and vanilla extract. When all is well mixed up, remove the mixer bowl and pour the flour mixture into it. Gently stir with a spoon. It is important not to overdo it. Add the remaining ingredients into the bowl and stir. In the form for muffins put paper cups and fill them neatly. On top sprinkle some flakes and put them into the oven. Bake for 25-30 minutes. Readiness can be checked with a toothpick put into a muffin. If a toothpick does not stick, then the muffin is ready. During this time, the top crust is not rosy and my wife puts the pan under the broiler for another 3 minutes. We take out the muffins from the oven, take out the form and let the wire rack cool. Done!